A bulging disc is a contained disc condition where the nucleus pulposus (disc’s center) has pushed against the annulus fibrosus (tough outer fibrous ring). This occurs without rupturing or tearing the outer layer, and it looks like a swollen mass. The bulging disc does not protrude into the spinal canal, however. How is a bulging disc different than a herniated disc? A herniated disc involves the nucleus protruding all the way through the annulus fibrosus, meaning the inner gel-like material seeps out. A bulging disc involves a protruding nucleus, but the inner material does not actually ooze outside the disc. 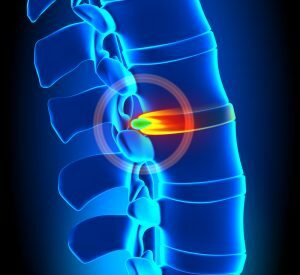 A bulging disc will induce the release of chemical mediators, which are inflammatory markers that irritate the nerve roots exiting the spinal cord. The symptoms of a cervical (neck) bulging disc will cause pain in the neck, shoulders, and possibly, radiating pain down the arm to the hand on the affected side. If the disc bulge in the lumbar (lower) spine, there is pain in the low back, hip, buttock, thighs, and possibly, shooting down the leg into the foot. There are two main causes of bulging discs: trauma and muscle imbalance. With trauma, the disc bulges related to being hit, a fall, a car accident, or another type of injury. Muscle imbalance involves pressure being placed on the disc that results in central material bulging against the outer disc layer. Muscle imbalances occur from using a computer, sitting slouched, writing, and other routine activities. Long-term imbalance causes altered spinal curvature, which results in disc bulging. Nonsteroidal anti-inflammatory drugs (NSAIDs) – These medications relieve pain, and reduce nerve irritation related to the inflammatory mediators. Physical therapy – The therapist teaches you good posture habits, proper lifting, as well as strengthening and stretching exercises that build spinal stability, increase muscle flexibility, and improve function of supportive tissues. Spinal decompression therapy – This involves a type of traction using an inversion table. With slight movement of portions of the table, the spine is decompressed, allowing the bulging inner disc material to retract to the center of the disc. Sympathetic nerve block – For people with nerve compression and radiating pain, the doctor can instill an anesthetic agent and/or a neurolytic agent onto the affected nerve roots. This “blocks” pain signal transmission. Based on a recent study, this procedure has a 90% efficacy rate, with the majority of patients reporting more than 50% pain reduction. Intradiscal electrothermal therapy (IDET) – With this procedure, electric current and heat are used to shrink and repair disc tears. A small catheter with a wire is inserted via a needle, and the catheter is positioned near the affected disc. According to recent clinical reports, this procedure has a 70% efficacy rate. Epidural steroid injection – To alleviate pain associated with irritated spinal nerves, a needle is inserted into the epidural space (surrounding the spinal cord), and a steroid, with or without an anesthetic, is injected. Based on research trials, this procedure has an 80-90% success rate. In a recent study of degenerative spine conditions, researchers review numerous studies and found that disc bulge occurred in around 30% of people age 20-80 years, and for those older than 80, the rate was 84%. The most common site for bulging discs is the lower back region (lumbar spine). Desert Interventional Spine Consultants offers top pain management in Gilbert AZ with Dr. Ajay Yeddu. As a Board Certified pain doctor, he offers both medication management and interventional procedures with exceptional results. Call us today! Botwin, KP et al. (2002). Fluoroscopically guided lumbar transforaminal epidural steroid injections in degenerative lumbar stenosis: an outcome study. Am J Phys Med Rehab, 81(12), 898-905. Brinijiki W, Luetmer PH, Comstock B, et al. (2014). Systematic literature review of imaging features of spinal degeneration in asymptomatic populations. Spine, 1-6. Lutz, GE, et al. (1998). 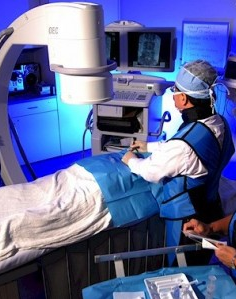 Fluoroscopic transforaminal lumbar epidural steroid: An outcome study. Arch. Phys Med Rehab, 79(11), 1362-6. Pauza KJ, Howell S, Dreyfuss P, et al. (2004). A randomized, placebo-controlled trial of intradiscal electrothermal therapy for the treatment of discogenic low back pain. Spine J, 4(1):27-35.